Living legend Fernando Alonso, who made a name for himself in Formula One and more recently was a beast at Le Mans, might finally officially be going off-road racing with team Toyota. He’s been test-driving a Dakar Rally-racing Hilux, and it sounds like he’s into it. OK, he actually sounds like an interview scene in Talladega Nights with a Spanish accent, but it’s cool to see with no uncertainty that Toyota is letting him explore the off-road world. The idea of Alonso taking his talents off the asphalt had been getting kicked around since at least December 2018. 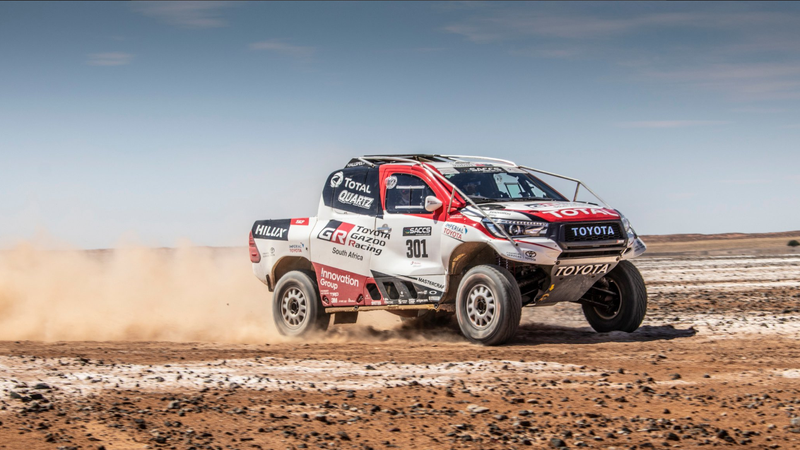 With Toyota coming off a huge win at this year’s Dakar Rally, it makes sense that the company’s racing division would want to ride the momentum and take this opportunity to get Alonso in the mix. RaceFans.net reported that Alonso “is evaluating whether to add Dakar to his to-do list,” earlier this week, in a post about the fact that the Formula One champ would in fact be testing a race-prepped Hilux in South Africa’s Northern Cape province. Obviously now that Toyota has posted the videos above and a whole bunch of pictures on its social media accounts, we know for sure that Alonso was indeed doing some off-road Dakar-style rally testing. Whether or not he’ll decide to attempt the next Dakar Rally, which will probably happen in about nine months, is to be determined but I love the idea of a driver of Alonso’s talents taking a spin in the sand.